5.06 When will my foreign currency order be delivered? When creating an order, we will clearly indicate the expected delivery date and the deadline to secure this date. We will also confirm the delivery date in the order confirmation. If you have a Standard account, your default delivery day will be in 2 business days by 1pm if you place your order before the daily delivery deadline on any business day. 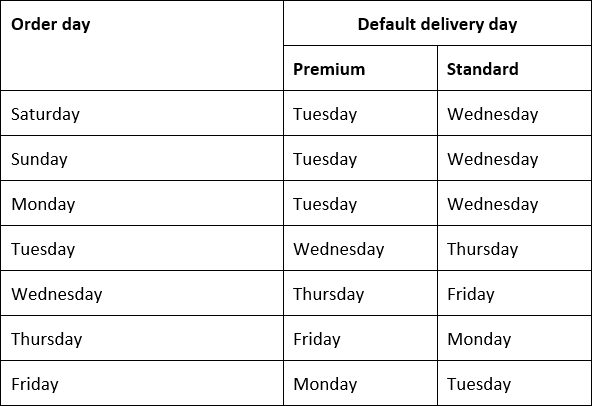 If you have a Premium account, your default delivery day will be next business day by 1pm if you place your order before the daily delivery deadline on any business day. If you have a Standard account, you can pay an additional fee for next business day, nominated business day, 9am or Saturday delivery. If you have a Premium account, you can choose next business day or nominated business day by 1pm for free. You can pay an additional fee for 9am or Saturday delivery. We despatch orders Monday to Friday from our distribution centre in the City of London, except on public holidays in England. Royal Mail will not deliver on a public holiday and certain other dates in each delivery country. If you place an order for delivery on a Monday, Royal Mail may attempt delivery on the preceding Saturday We will attempt to notify you if this is the case, but if you are unavailable you may need to collect the order from your local Delivery Office on Monday. Please always allow at least one additional business day before you travel in case of delays in the Royal Mail supply chain. Royal Mail's insurance will only compensate you for the delivery charge, not the currency, if they are late.